I’ve done it. And I'm ahead of schedule. 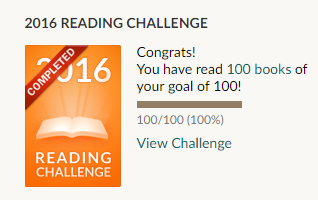 I can scarcely believe it myself.I anticipated a scramble towards the end to get it done but I was wrong. However, without the numerous children’s books loaned to me along the way I would never have achieved this at all.So massive thanks to all my students who lent me their darlings. Snuff This book reminded me yet again of why Pratchett is one of my favourite authors. It covers world and local issues with insight and great wisdom while making me guffaw at the very top of my lungs. I have yet to read a Pratchett which doesn’t make me howl with laughter in several sections. I loved, loved, loved it. And am delighted there is still much of this great genius’ oeuvre for me to discover as well as all my favourites to reread. If you’re a long standing follower of my blog you’re well aware of my views on Christmas and Christmas presents. But if you’ve only just joined this happy band then please refer to the posts Christmas CheerEpisode 1 & Episode 2 of this blog to find out my true feelings on the festive season. But now I’d like to get down to the serious business of discussing big store ad campaigns. I’ve never really followed them much in the past but found myself inadvertently drawn in to the midst of the debate on which is the best one this year. The first ad I spotted was by House of Fraser - this is the ad with all the dancers and the distinctly Thriller style dance scene.That’s the main reason I noticed the ad.